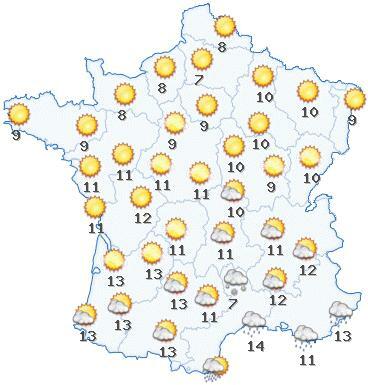 And find informations, maps, hotels, weather forecast, pictures,... on every french town ! With Map-France.com search and find maps, hotels, weather forecast, pictures, statistics and all data you need on every french town ! Each department belongs to a single region. (Each of four overseas region being composed of a single department). France is divided into 101 departments. They are divided into 343 districts ("arrondissements"), 4 058 townships ("cantons") and 36 699 Towns ("communes"). Each department has a capital city or prefecture which includes its institutions. This capital is often the largest city of the department. According to figures (in 1999), the median population of a department of continental France was 511 012 inhabitants. The removal of one or more local levels is being debated in France for several years and especially the option to remove department level. For now, the Balladur committee dealing with the reform of local government did not adopt this proposal, so there is currently no change at the departmental level. At right, you will find the map of French departments. Clicking on a department link, You will find a detailed map of the department and statistical informations, photos, travel guide for all cities of this department. The region is the first level of administrative divisions on the map of France. Before the French Revolution of 1789, France was divided into provinces from the historical feudal history. Some of these regions roughly correspond to the current regions. During the revolution these provinces were abolished and the French territory was divided into 83 departments. On 5 April 1919, the first ministerial decree establishes the first regional grouping called "regions Clémentel". From the First World War, the development of transport, urban, building regionalist ideas, leading some to question the desirability of creating larger administrative divisions than departments. The first election of Regional Councillors by universal suffrage was in March 16, 1986. 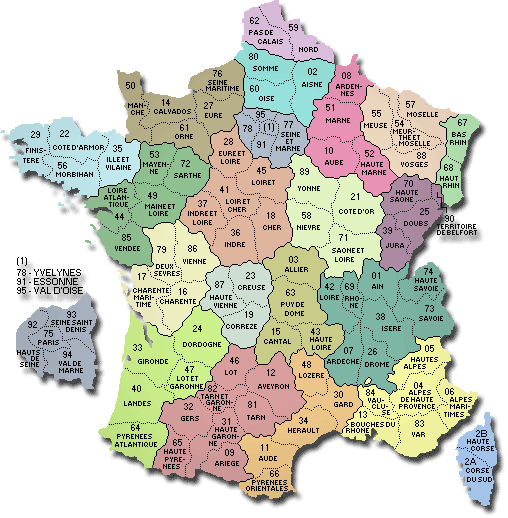 Regions became officialy french divisions as departments and municipalities. France is divided into 27 regions, which in turn are divided into 101 departments, 343 districts ("arrondissements"), 4 058 townships ("cantons") and 36 699 Towns ("communes"). 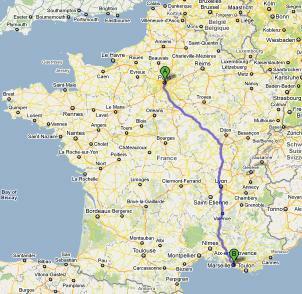 At right, you could find the map of France regions. Clicking on a region link, you will find a detailed map of the region and statistical informations, photos, travel guide for all cities of this region. 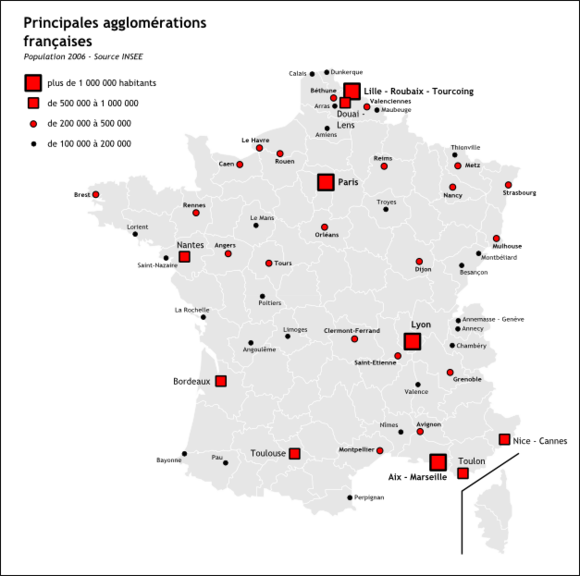 Here are the 100 largest cities of France (population 2006). We do not count here the concept of urban area but the municipal population. The population is increasing by 366 500 people by 2008. Northern France is the most populated with about 40 million people (or 2 / 3 of the population) against approximately 22.5 million in the South (or 1 / 3 of the population) (metropolitan France only). Within the European Union (EU) demography of France stands out for the life expectancy of women (84.23 years 2008 estimate) which is the highest in Europe and a fertility rate (2.02 in 2008) the highest in Europe. 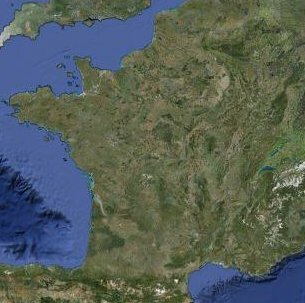 At right, you could find the map of France's largest cities. By browsing the site you can view a map of France, statistics, informations, photos and travel guide for each town of France. 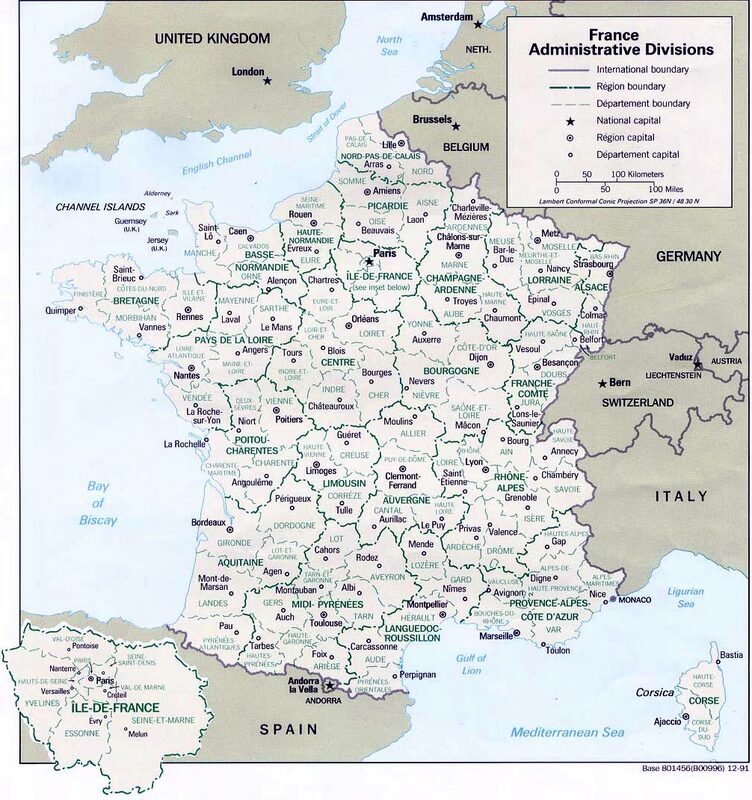 Administrative divisions : France is divided into 27 regions, 101 departments, 343 districts (arrondissements), 4 058 townships (cantons) and 36 699 Towns (communes). Population of France : In 2010, the population of France was estimated at 65 447 374 inhabitants. The highest mountain in France : The highest point on the map of France is the Mont Blanc in the Alpes, peaking at 4 810.45 m.